A good friend of mine told me about Bailey's. His description of the burger, "These are old-timey, Texas-style, mustard and onion burgers that knock 3 months off of your lifespan upon consumption." Well I hope the part about knocking 3 months off my lifespan wasn't true - but the rest of his recommendation certainly was true. 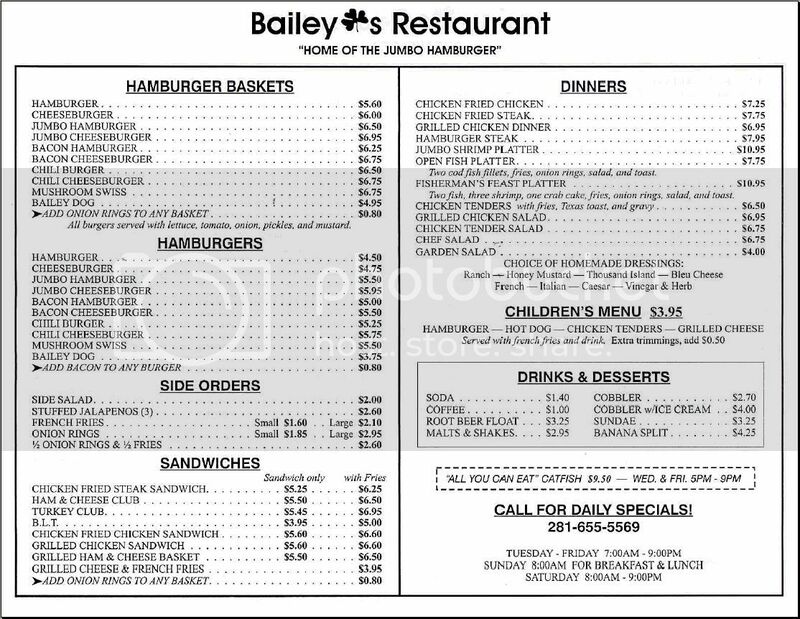 The Bailey Jumbo burger is truly an old-timey Texas-style burger. Man oh man it was reaallly goooooooood!!! The first thing I noticed when the burger basket arrived was the grease that was on the paper. (see the picture below) Then my eyes were led to the patties themselves which were also covered by a good amount of oooze. Just like my momma always said about my girlfriends - doesn't matter what is on the outside - what matters is on the inside. This applies to burgers as well. After my first bite - I was pleasantly greeted by a very moist - very ooozy burger. 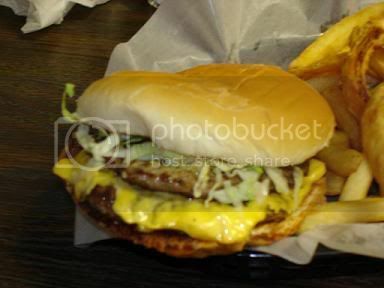 The vegetables that were piled on the burger combined with the juices from the cheese and meat to make a very pleasant flavor. Very good oooze! The Jumbo is a double meat - double cheese monster. It certainly will give your belt a run for its money. I know when I got up to leave I could feel Mr. Jumbo Cheeseburger pushing out from my belly. The patties are not too thick - but just thick enough to get the flavor from the meat. I recommend having double jointed jaws to bite into the Jumbo when you are half way done with it. I had to push it down a little to get it all in. It just wouldn't be right to talk about the meat on this burger and not mention the cheese meltage on this thing. It was perfect! It just ooozed itself all over the meat which made the burger that much better. All in all - good herd killer burger! Definitely a 2 handed burger. No way you can one hand the Jumbo. Even at the end I found that I needed an extra hand to keep the patties, buns and vegetables all together. The Jumbo Cheeseburger was $5.95. If I had paid that and wasn't really full when I left - I would say it wasn't worth it. But - I was full when I left. 6 bucks is borderline - but I still think it is worth the money. 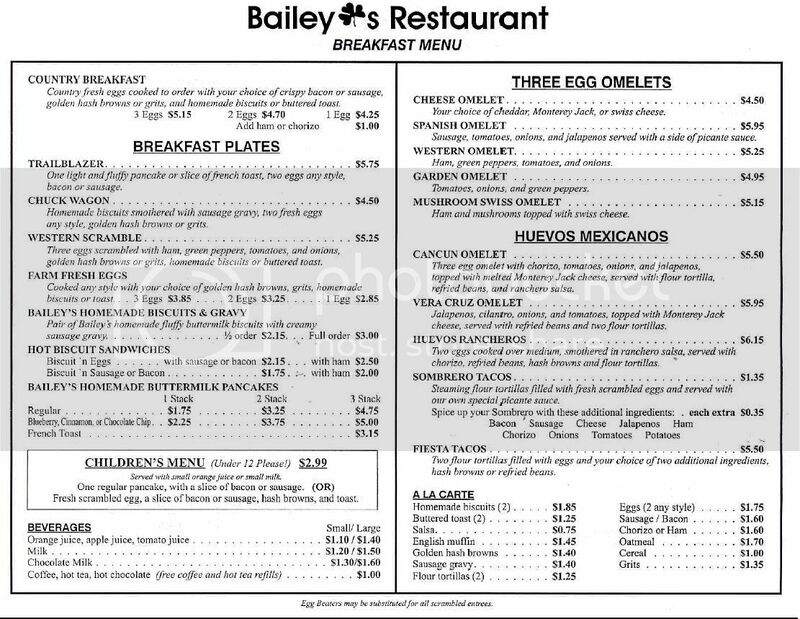 Bailey's had a pretty comprehensive menu. They have Chicken Fried Steak, salads, kid's menu, and ofcourse all the usual burgers, fries, O-rings, etc. We tried the onion rings, frieds, tator tots, chicken sandwich, and grilled cheese. Everything was really good. Mrs. TexasBurgerGuy really enjoyed her chicken sandwich. The O-rings are pretty dang good. I like my O-rings not so greasy. The fries are the long, thick variety - served good and hot. Tots were just plain ol' tots. Bailey's also makes their shakes, malts, sundaes, root beer floats and banana splits with Blue Bell ice cream. For those that have never had Blue Bell ice cream... well... I just feel really sorry for you because it is without question THE best ice cream on the planet. Bailey's is located in a small strip center just off Stuebner Airline. It certainly had the look from the outside of a hole in the wall burger joint. When we opened the door and took a whiff of what was going on inside - we KNEW we found a good place. The air was filled with smoke from the fryer. Friday night is one of 2 all you can eat catfish nights and the place was smoky and greasy. I think that Bailey's might have some ventilation issues - but it didn't bother us. We found it pretty funny that the whole restaurant was non-smoking despite all the smoke in the place from the kitchen. 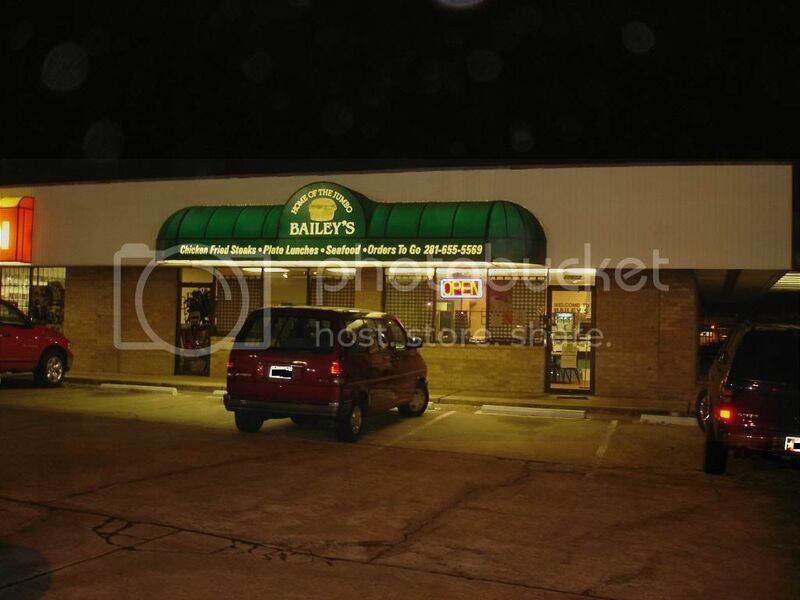 Bailey's accepts credit cards and cash - they do NOT accept checks. Waitstaff was very nice to us and took care of refilling our drinks promptly. A nice dining experience for sure. Bailey's is just north of Klein High School off Stuebner Airline. You can go down Louetta to Stuebner Airline and go north. It is probably an 1/8 of a mile on your right after turning onto Stuebner Airline. Overall a very good dining experience. I wasn't quite sure what to expect when we walked in the door. After getting my food and interacting with the staff at Bailey's - I can understand why Bailey's has been around Houston for many years. If Bailey's keeps the same formula of good food and friendly service - I bet they will be around for years to come. Oh my...I'm just drooling just reading your review and I'm envious too! We don't have anything remotely as wondeful as that kind of burger here. They don't FedEx do they? Have a pleasant weekend to you and the Mrs! bailey's is great. we call it the cardiacburger. I ate at Bailey's last night. They must have put on a show for you or you hit them on a good night. The place smell like burned grease/oil from the catfish frying. My jumbo was dry with NO OOZE at all, the bun was stale and the veggies were not first class either. My onion rings were so so but the overall burger experience was not good. I'd rather eat a Whatburger instead of their once great "Jumbo". The meat pattie was very thin and even two of them was not even on the herd killing scale. I looked at the old photos of the old days of the ownership and it looked much more old school and better. Better eat here quick it will be closed soon. The menu is not extensive, but the food is good. I never had the breakfast util recently. I highly recommend it. Their pancakes and biscuits are great! 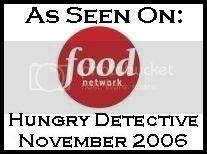 We have eaten there several times and the smell, service and food was excellent. We have had the burgers, chicken fried steak and grilled chicken. I don't even have to ask my family twice if they want to go to Bailey's. They will pick it over any other place. We ate here last night and it was very good. I'm a little concerned because at 6:30 on a Saturday evening we were the only ones there. Baileys is the most awesome place to eat, breakfast, lunch or dinner. great food and service. Ate there tonight after reading reviews. I have to say I was not impressed. Burgers were overall good but nothing to write home about, actually a little dry (no ooze factor). 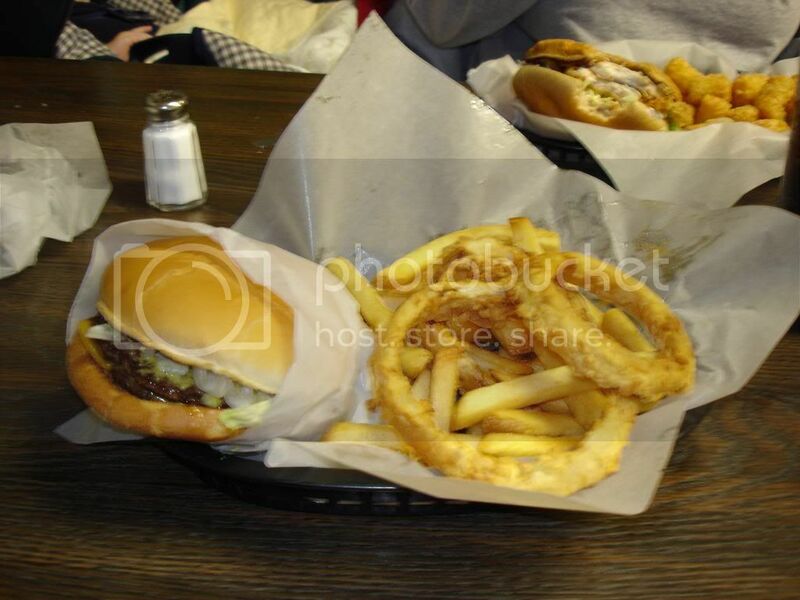 I did not like the onion rings at all & the fries were just ok. My big burger at $7.95 plus $1.10 for onion rings instead of fries is way too much for what you get. Our total bill was $45.00 for 4 of us. for burgers ? I didn't like that they Required me to pay 18% TIp on Tax. I asked that it be taken off, but they would not. Won't be back, rather go where I'm treated fairly. Won't recommend Bailey's to other either.